IMPORTANT UPDATE: The application deadline has been extended to February 10, 2018. No further extensions or late applications will be accepted. The application has also been edited to help streamline the process. Applicants who have already applied do not need to resubmit. 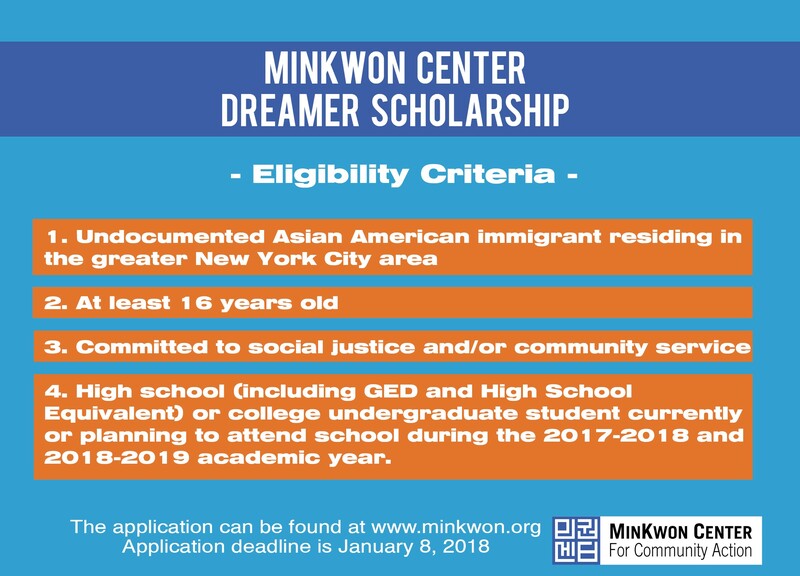 The MinKwon Center and the Asian American Dreamers Collective (AADC), MinKwon’s organizing group for undocumented young adults, has created the Dreamers’ Scholarship Fund. The fund is part of MinKwon’s continuing efforts to support, empower, and engage Asian American youth to become the next generation of civic leaders. ● High school (including GED and High School Equivalent) or college undergraduate student currently or planning to attend school during the 2017-2018 and 2018-2019 academic year. Completed applications must be submitted by February 10, 2018 to scholarship@minkwon.org. Late or incomplete applications will not be accepted. Since the early 2000’s, the MinKwon Center has been organizing and assisting Asian American “Dreamers,” undocumented youth and young adults who came to the United States as children. Through its advocacy efforts, the organization, along with hundreds of other immigrant rights groups across the nation, helped bring about the passage of the Deferred Action for Childhood Arrivals in 2012. However, as of September 5th, 2017, the Trump administration rescinded the program. Dreamers continue to face significant challenges as they attempt to further their education and start their careers. They are ineligible for federal financial aid and must often balance work and school to support their families.